As mobile user acquisition costs skyrocket, push notifications are becoming a key strategy to keep your users engaged past the install. However, choosing a push notification tool can be a job of its own. 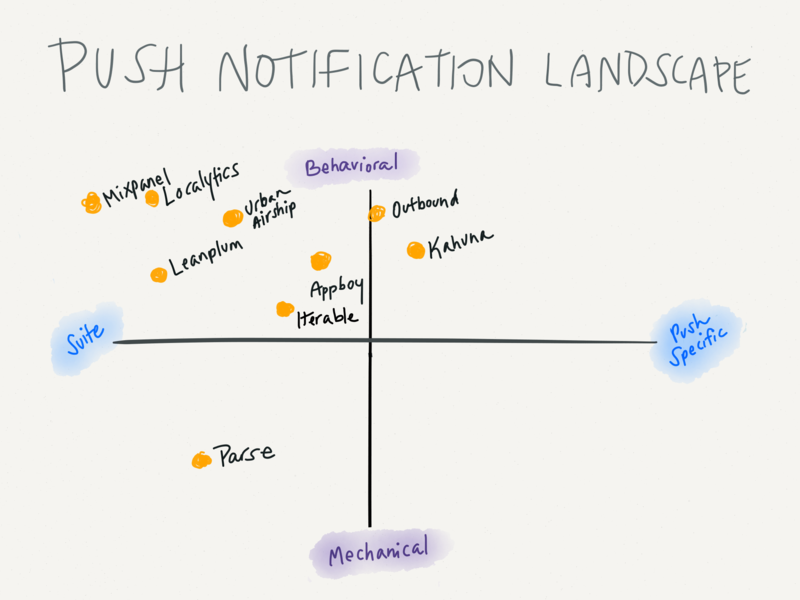 In this blog post, we’ll provide a framework for evaluating push notification tools, cover the top players in the market, and discuss which tools are best for you based on your role, company size, and objective. Before you embark on your journey to find an awesome push tool, you have to ask yourself two questions. 1. What types of messages are you sending? The first question to answer is what types of messages you want to send. There are two types of push notifications your messages can fall under. Similar to the email world, the first (and admittedly less sophisticated) type of message is “batch and blast” or what is called Mechanical push. You’ll send these messages when users opt-in to notifications for specific types of topics — think Breaking News or San Francisco 49ers score updates. Also included in the mechanical category are immediate, event-triggered notifications. For example, you might receive a message from Venmo that “Emily just paid you $23 for Ramen,” or from Visa letting you know that “Your credit card was just charged”. The key with understanding Mechanical push is that they are immediate, list-based, or event-triggered notifications. If Mechanical messages are the only types of notifications you want to send and you’re looking for other developer services like crash reporting, going with Parseis a good bet for a team of developers. It’s the Mailchimp equivalent for the mobile world — lightweight and easy to get started with. The second type of notification is Behavioral, when you send a personalized message based on past activity someone has done in your app or real-time information like location. These messages are often super personalized and deep link into a particular, contextual page of your app. For example, Steve Madden sends you a message that those boots you were browsing last week are now available in your size. When you tap in, the message takes you right to the product page for the shoe with your size checked. Behavioral messages, in both the email and the app world, perform much better, and it’s not rocket science to figure out why! The messages are highly targeted, timely, and personalized. And, basically every provider that does behavioral messages, also supports mechanical. They usually compete on scale, reliability, and functionality of behavioral triggers. There are only few reasons you might not want to use Behavioral notifications: Your app is very transactional, or you’re resource constrained. Perhaps you don’t have technical help to track behaviors your customers are doing in your app or time to set up these campaigns. 2. Do you want an all-in-one or focused solution? The next decision you’ll have to make is if you want a tool that focuses completely on messaging, or if you want something that also offers product analytics and in-app a/b testing. Going with a tool that’s focused on messaging means that the team you’re working with is fully invested in making that experience amazing. Most tools in the messaging category have full-featured options for sending personalized messages, reporting on campaigns, a/b testing copy, and delivering notifications at the right time for each user. Many of the players in the space who started in push are starting to offer email, so look out for that if you’re interested. Kahuna, and Appboy are the top players here. That said, Outbound and Iterable are also good options to check out if you’re looking for a cross-platform tool covering push, email, and SMS. These platforms subscribe to the belief that you should first think about where your customers are getting stuck in your product and then use the right channel to send them a message if they don’t take the next step. Another type of tool is what we call the “all-in-one” mobile marketing and product suites. They offer push and email services, but also do in-app a/b testing, and funnel analytics. If SDK bloat is a big issue for you, these types of tools including Mixpanel, Urban Airship, Localytics, and Leanplum might be a better choice. In terms of pricing, most tools will let you send up to 1,000,000 messages or communicate with 10,000 users for free or on a trial. Then the cost levels up or you have to call to get enterprise pricing. For many of the all-in-one solutions, the push notification and other marketing features are priced as an add-on to the core analytics offering. Now that you have an idea of your options, let’s get into the nitty gritty of what each of the popular services offer. Dynamic deep linking that takes users to unique place in the app based on their past behavior. A “ghost push” feature to track which push notifications are causing people to uninstall or opt out of any message in any campaign that helps you find the line between helpful and spammy. The option to use their pre-built segments of new, dormant, active, and inactive users or create custom segments based on an unlimited number of events and attributes. A-E testing and message send time optimization to make sure the highest performing message hits your audience at the right time for each individual. Objective: Drive customer lifetime value through repeat purchases. Urban Airship has over 30,000 apps using its service, from startups to large organizations like Walgreens, ABC News, Alaska Airlines and Airbnb. Helpful for both developer and marketing teams, they offer well-documented APIs for mechanical messaging as well as behavioral targeting capabilities that allow marketers to define segments and deliver highly relevant, real-time messages. Urban Airship offers numerous messaging types such as interactive push notifications, in-app messages an in-app inbox (message center), and mobile wallet. It also offers audience intelligence, funnel app analytics, a-b testing, and a user-level data streaming service to power behavioral messaging in other channels like e-mail, ad platforms and more. A full suite of mobile messaging and content publishing tools including interactive push notifications, in-app messages, rich landing pages, mobile wallet, and sport for rich messaging (images and video). Easy to use campaign tools and templates that allow you to add a deep-link, develop a landing page, social share, and define segment attributes for any message. Segmentation tools that allow you to personalize your messaging based off in-app behaviors, location (triggers and history), preference center, app events as well as cross-channel data from a CRM or other system. Audience intelligence to identify user-level trends for future campaigns. App analytics are also provided with funnel analysis, conversion reporting, cohort analysis and RFM reporting. A mobile data streaming service that allows you to send user-level information to business systems for omni-channel behavioral targeting and analysis. Objective: Grow and retain your mobile audience. Segment audiences based on age, location, and language, and schedule messages in advance. Preview notifications exactly as they will appear across the devices you target. Send notifications via the web portal, REST API, or client SDKs. Monitor the effectiveness of your push campaigns open rate analytics. Confidently evaluate your push messaging ideas with A/B tests to create the most effective, engaging notifications for your app. Objective: Send basic notifications to customers and understand what is making your app crash. Target content based on detailed user profiles and past in-app behavior, such as the frequency of app use and number of in-app purchases. Set up user action goals for each message and measure conversions. Create groups of users based on their location to send geo-located messages. Send messages based on when each user will most likely engage with your app. Automatically insert details like nearby movie times, customized recommendations and proprietary content directly into messages. Objective: Drive mobile-centric customer engagement, retention and advocacy. Set up automated, trigger-based campaigns based on what users do in your app for email, push, and SMS. Send broadcast campaigns with a one-time message to a segment of your users based on their history. Track any action your users take in your website or app and immediately trigger an event, without creating a segment in advance. Objective: Activate users for a cross-platform product. Iterable started as a marketing automation platform and now also offers push notifications and SMS. It’s best if you’re working with a consumer audience, want to send messages across web and mobile channels, and use both mechanical and behavioral messages in your camapigns. They have a visual workflow for designing lifecycle and engagement campaigns, which makes it easier to map out your messages. Trigger personalized messages based on user attributes and specific in-app behaviors. Programmatically tailor the user interface to individual users, for example, switch the default share option to a user’s favorite social platform. Insert custom values within variables and messages to make them feel very personalized. Send messages at the most optimal time, based on each individual user’s past usage pattern. Objective: Drive retention and engagement with event-driven push notifications. Target campaigns to an existing segment of users, or create an ad hoc filter for each campaign. Schedule campaigns to go out immediately, at a single point in the future, or set up an automated campaign that sends on a recurring, scheduled basis to newly qualified users. Test up to 5 message variants for each campaign and see what wins. Track impressions, clicks, and conversions over time for each campaign, and set up funnels to see how users from each campaign engage overtime. Objective: Drive engagement across the entire user lifecycle. Send emails, push notifications, in-app notifications, or SMS text messages based on which platforms people prefer using your product. Set your messages to go out at optimal time, and Mixpanel will tailor that to each user’s timezone. Experiment with your notifications by a/b testing the subject in an email or the message in a push notification. See how your messages perform against conversion events you’re already sending to Mixpanel. Objective: Improve funnel conversions with personalized notifications. We hope this deep dive gave you a better idea of which push tool is best for you! As you can see from this list, many of the push platforms are trending toward bundling analytics and marketing “jobs to be done” into a single solution. However, it will be interesting to see if this continues. In the history of web analytics and email tools, we’ve seen single point solutionseat away market share from monolithic suites, and predict this trend to continue in mobile. The biggest factor to watch is how technology to reduce SDK bloat evolves. We currently offer most of these push tools on our platform. You check out our full list of integrations here, and request support for new tools here.